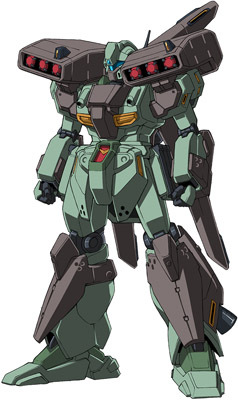 Shortly after the RGM-89 Jegan was launched the Earth Federation had Anaheim Electronics develop new versions of the mobile suit that were oriented towards specific missions. One of these developments was the RGM-89S Stark Jegan which is designed for heavy combat missions. The overall performance is greatly increased over the standard RGM-89 Jegan. The Stark Jegan's body is fitted with additional armor, thrusters, and new armaments are incorporated across the body, including a pair of machine guns and two sets of missile launchers. The large missile launcher is capable of mounting a nuclear warhead. The Stark Jegan can also carry a bazooka or beam rifle. The Stark Jegan is slower with the additional armor and armaments, but if necessary, they can be ejected. All the Jegans have Gundarium alloy armor which makes up 25% of the outer armor while most of it is made out of titanium alloy/ceramic composite and it also has a semi transparent coating or armor on it.